I love to use holidays to teach my children. 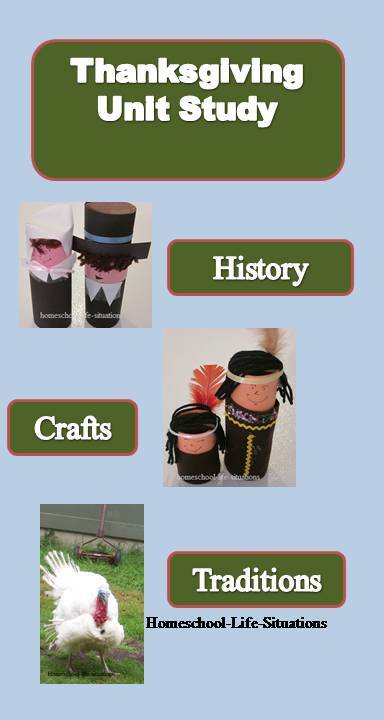 Here is a fun Thanksgiving unit study that combines history, literature, and Bible. For history teach your child why we (in the United States) celebrate with a feast on the fourth Thursday in November. Then read some poems about the Pilgrims and turkeys. Do your children enjoy crafts as much as mine do? I have included some fun hands-on projects. I like to combine Bible verses with what we are learning. See what the Bible says about being thankful. Read the Psalm 100 in your favorite translation. What does the passage say about giving thanks? Look for more verses about thanksgiving and giving thanks such as 2 Corinthians 9:15 and Philippians 4:6 Colossians 3:15,17. Copy work: Have your child copy Psalms 100:4 in their best handwriting. Have him practice writing the verse throughout the week. Also have your child illustrate his paper. When I was at the library the other day I checked out Merry Comes Our Harvest in Poems for Thanksgiving for our Thanksgiving unit study. In the book you will read poems about the first Pilgrims and what to eat for dinner. The poems were by different authors. Lee Bennett Hopkins compiled the book. The book would be good to use if you wanted your child to write a poem for the holiday. There are several different types of poems including an acrostic. I saw the poem in the Childcraft book number 9 page 294-295. I have also heard the poem sung. The Pilgrims were people who sailed on the Mayflower in 1620. When they saw land, William Brewster led the passengers in a time of thanking God for a safe voyage. The first winter was hard. Many of the Pilgrims died. The next year they had a good harvest. So Governor William Bradford declared a three-day feast. The men went out and shot waterfowl and turkeys. They also had venison, fish, berries, and clams. Boiled pumpkin was also on the menu. The Pilgrims invited the Native American that had helped them learn how to live in the new land. Everyone brought food. But this was not the start of the national holiday. We can thank Sarah Josepha Hale for making Thanksgiving a national holiday. Sarah Hale was an interesting person. Her mother taught her at home. Her education went beyond what most girls learned in the 1800's. Her brother even shared what he had learned in college with her. In her lifetime she was the editor of two lady's magazines. It took her seventeen years and many requests to make Thanksgiving a national holiday. But in 1863 Sarah convinced President Abraham Lincoln to declare a national day of thanksgiving. He proclaimed the last Thursday of November as the day. You can read more about Sarah and the beginning of Thanksgiving in Pardon that Turkey How Thanksgiving Became a Holiday by Susan Sloate. The book is a station 3 level in All Aboard Reading series. Level three is for children who can read alone. I also picked up more books at the library about thanksgiving. Most are very similar stating that thanksgiving started with the Pilgrims. I liked World of Holidays Thanksgiving by Marilyn Miller because of the historical pictures. The book also mentions harvest celebrations in Canada, Czech Republic, Sierra Leone, and Cameroon. World of Holidays also has directions to make a cute turkey out of a pine cone, walnut, and colored paper. National Geographic 1621 A New Look at Thanksgiving present a slightly different view of the Native Americans and the first Thanksgiving. Food is a big part of our Thanksgiving celebration. Most American will eat turkey, cranberry sauce, corn, or beans, sweet potatoes, and pumpkin pie. The foods are native to the Americans. Turkey, corn, and pumpkin were probably eaten by the Pilgrims. The Pilgrims probably did not have pie because of the lack of sugar. Also they did not have ovens to bake the pie in. Crafts can make a thanksgiving unit study fun. Your child can use the projects to decorate the house. 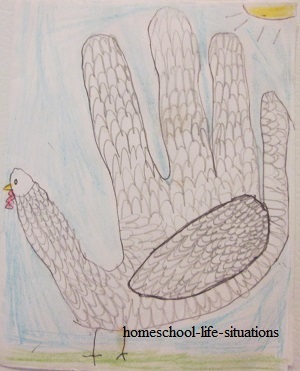 One of the activities that I did with my children when they were young was to make hand print turkeys. You can use the turkey to make Thanksgiving Day cards. Send the cards to grandma, grandpa, aunts, uncles and other friends and relatives. The child is to place hand on paper with fingers spread out. Parent needs to draw around hand. The child then draws eyes and waddle on thumb. Decorate the four other fingers as feathers. Draw legs and feet below the palm. When I was at the library the other day I picked up All New Crafts for Thanksgiving by Kathy Ross. Your child can make turkeys, place cards, a Native American headband, Pilgrims and other holiday items. I made the Native American drum. 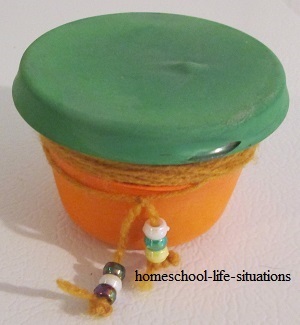 To make the drum you will need a plastic fruit cup, two balloons, yarn, and some pony beads. I didn't have a fruit cup, so I used a similar sized plastic container. I had some difficulty stretching the balloons over the top and bottom of the container. 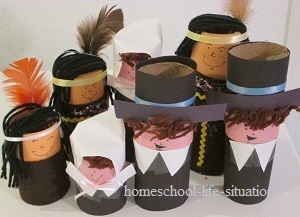 My daughter helped me make the Pilgrims and Native Americans out of paper towel rolls. I found that using thinner paper than construction paper was easier to use. We used double backed tape to secure the paper on the roll and regular tape for collars. She attached the beads with hot glue. If you have young children you could try white glue but it may not work. My daughter had trouble with the beads and hot glue. I hope that your children had fun learning about the Pilgrims with this Thanksgiving unit study.